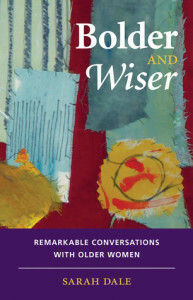 The author of Bolder and Wiser shares her story behind the book. I’m 49. I’ve hit the menopause early. My children are growing up fast. I have a sense that I’ve barely started with my career. At the same time, my parents are ageing, my hair is going grey and the phrase time flies doesn’t even begin to describe what seems to be happening. So why spend hours seeking out women at least ten years older than I am, transcribing the conversations and writing a book about it? Isn’t there something more pressing to do? I am a psychologist and author. I love psychology and I love writing. I have been interested in both all my life, whether these activities are paying the bills or not (it’s good when they do). The idea for this project was, in hindsight, first hatched when I was forty, when I met an inspirational sixty year old woman called Pam. The years passed and Pam sadly died well before her time. In the meantime, I was listening to increasing numbers of coaching clients talking about the considerable challenges of being in mid-life, mid-career and mid-generation. And I was feeling much the same myself. As fifty began to loom, I wanted to know ‘what matters’ and ‘what doesn’t’. Increasingly, I found I was irritated if I felt that I was wasting time or energy on things that didn’t seem that important but equally, I disliked feeling urgently driven in a quest to cram in everything I thought had some merit to it (far more things than there is time or opportunity for). I wanted to be spending my finite time, energy and motivation in a way that felt it had some purpose – to both my life, and, I hope, to other people’s – rather than notching up a list of ‘things I did before I died’. I didn’t want to be a spinning top, multi-tasking in an ever more desperate attempt to fit everything in, and I also didn’t want to fill my time with stuff – there’s never any shortage of that – that didn’t quite seem to scratch the itch that this mid-life turmoil was producing. It gradually dawned on me that we all have the resource we need to negotiate through the choppy waters of middle-age – people who have been there first. My interests and experience as a psychologist and writer could be applied to exploring what they had to say. Rather than try and work it all out for myself, I could ask them. What matters, and what doesn’t? I set up the first couple of conversations. I recorded them and transcribed them. It was time-consuming. It was also an eye-opener. Really listening in this way was fascinating. I could feel myself questioning some of my assumptions. I started challenging some of my habitual approaches to a variety of aspects of my life: my appearance, motherhood, marriage, my relationship with money. How do I approach risk? How kind am I to myself and other people? Am I trying to be perfect? I was hooked. I decided on twenty conversations, to get a wide range of women (the oldest of whom were 85), without turning it into an overwhelming exercise. I kept scampering back to the transcribing, feeling almost guilty about enjoying it. When it came to writing the book, I can honestly say it was the most motivating project I’ve ever undertaken. I even met my own self-imposed deadlines (which surprised me). I have finished up with a book that – even if no-one else reads it – has altered my outlook for the better as I look to the next decade and beyond. My hope is that if, like me, you are feeling a little all at sea about what ageing really means for you, it is a helpful read. Let’s go boldly forth together! Sarah Dale is a practising occupational psychologist, coach and author (aged 49 and a little bit). She is the author of Keeping Your Spirits Up. Follow her on twitter (@creatingfocus), Facebook (Sarah Dale – author) or sign up for her fortnightly newsletter on www.creatingfocus.org. Sounds an inspiring book from a great author. Going to get a copy now. 6 Top Tips for Life from Women over 60 given for Younger Generations. Do you agree that women are most confident about their bodies at the age of 52?